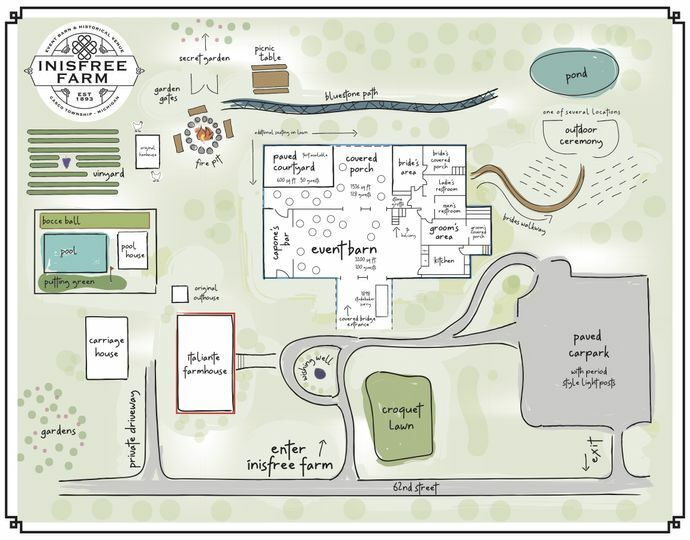 Inisfree Farm, LLC in Casco Township is a barn and farm wedding venue that serves Southwest Michigan, Chicago, Kalamazoo, and Grand Rapids. This property with history and gorgeous natural surroundings is the ideal location for any wedding celebration. 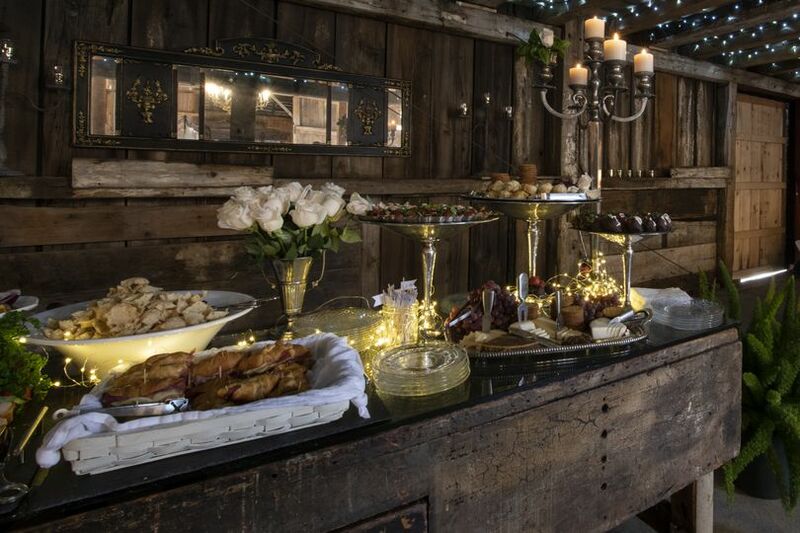 The authentic 1893 barn, on-site accommodations in the Italianate farmhouse and even an Irish pub are a few of the perks of this unique location made available for dream weddings by owners Bruce and Peggy. This farm is located on 30 pristine acres and was established by a Civil War officer in 1893. 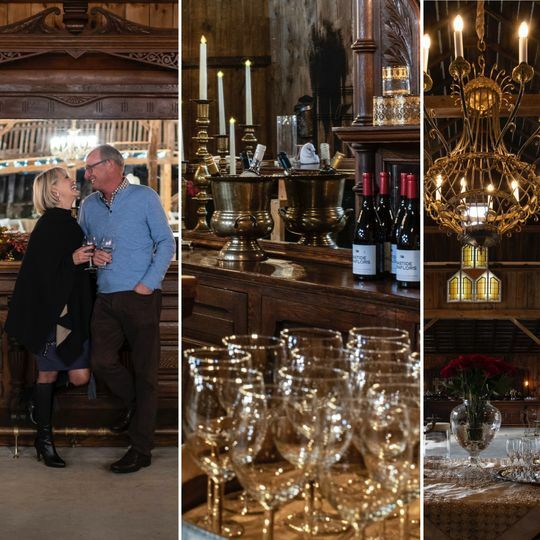 The original barn offers 30-foot ceilings, glorious wood beams and elegant, vintage chandelier lighting throughout. The balcony, once a hayloft, is now the perfect location for your entertainment. Comfortable seating is offered, as well as room for tables and chairs. Another piece of this location’s history includes the 18-foot bar that is over 100 years old, initially located within a Chicago speakeasy that Al Capone frequented. 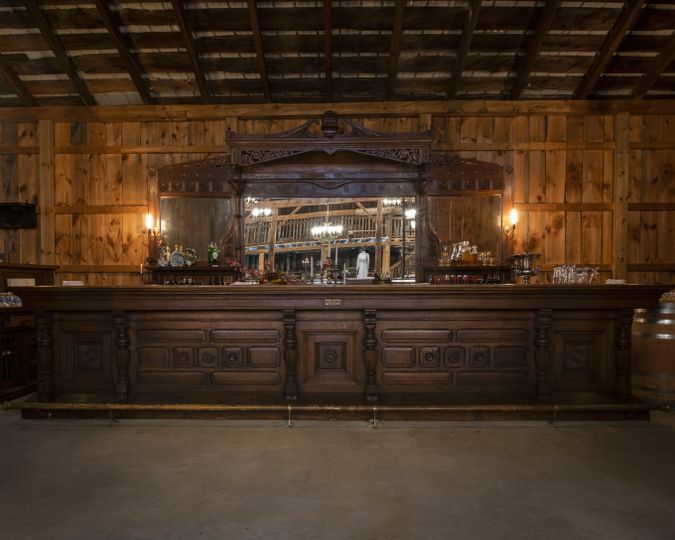 Now home in Inisfree Barn, “Capone’s Bar” is a highlight for your beverage service. 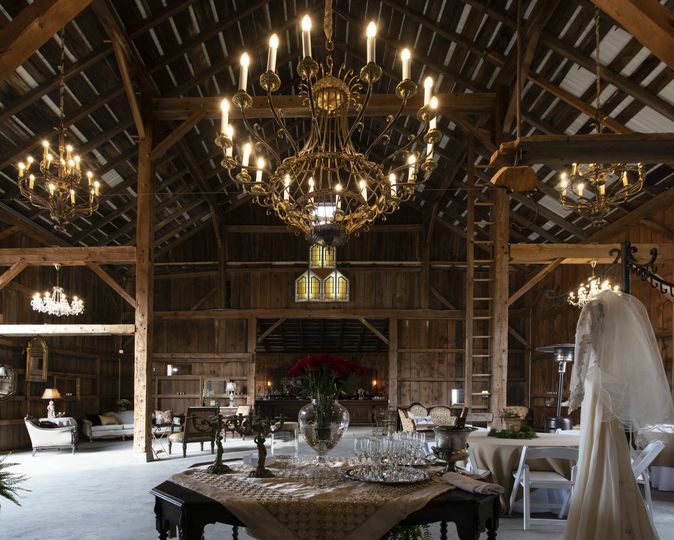 The interior barn space spans 3,200 square feet and can easily host up to 100 people. 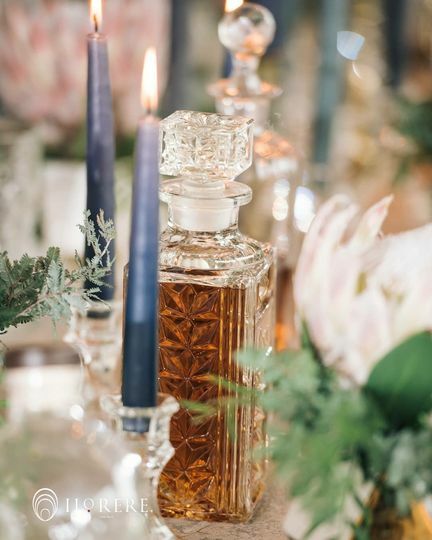 The blend of vintage and elegance will create an intimate space that is perfectly romantic. Venture outside to a spacious covered porch (1536’) and paved courtyard (600’) which can increase the accommodation size to 300 guests. In case of inclement weather, the paved courtyard can be tented. Rain or shine, we have you covered both inside and out. Multiple outdoor ceremonies spaces are available if that is what you desire. You can choose from the hillside location amongst nature and the nearby pond or the grape vineyard area. Additionally, you can exchange vows in a secret garden, also with a stunning view of nature and ideal for smaller ceremonies. 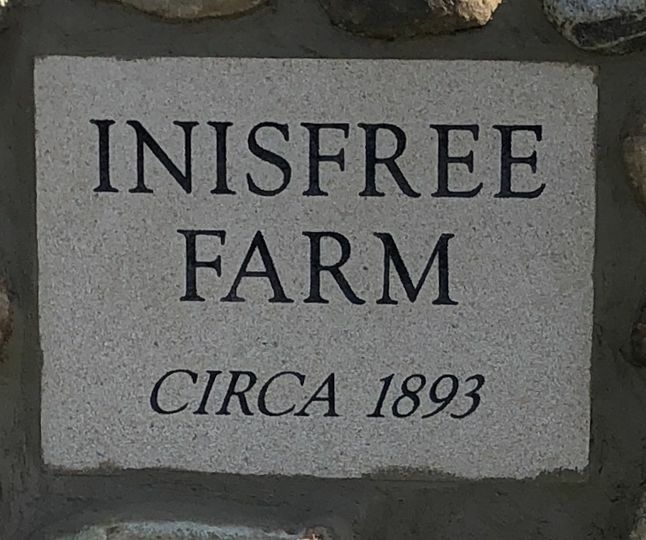 Other details of Inisfree Farm include an entrance driveway with stone columns, wishing well, covered bridge entry, catering kitchen, dressing rooms with covered porches, two restroom facilities and a large paved Car Park lined with period style lampposts. 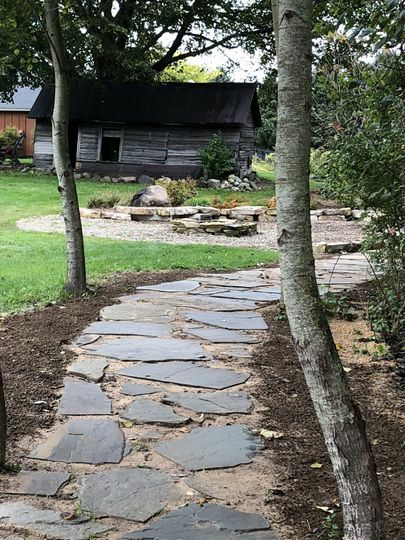 With a venue reservation, Inisfree Farm, LLC offers a Retreat Package - a two-day stay in our Bed and Breakfast accommodations in the beautifully restored Italianate Farmhouse. The farmhouse features three luxury suites that have both modern amenities and the historical personality of the 19th-century house, Irish Pub, sunroom, and inviting verandah. 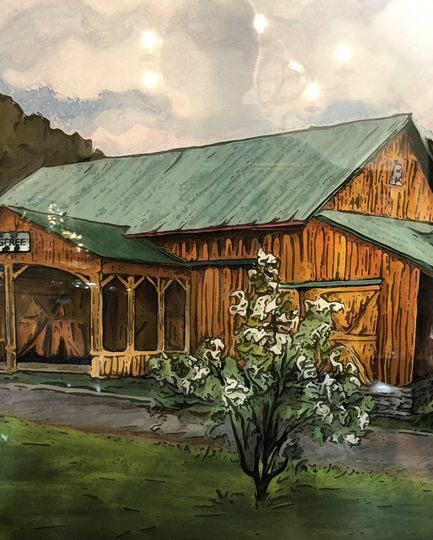 Outside pleasures are a resort size heated pool, poolhouse with two bathrooms, hot tub, putting green, bocce ball, firepit, croquet lawn, a fully stocked pond, grape vineyard and walking trails. Retreat Package gives you the opportunity to enjoy our resorty property by hosting a Poolside Rehearsal Dinner, cocktail party, spa day or simply a fun day by the pool. Many options! For additional accommodations, a five bedroom, three bath house can be reserved. Just 10 minutes from Inisfree Farm, a shuttle can be provided and breakfast at Inisfree Farm is an option. For more information about services the venue offers, couples can contact the venue directly. A Perfect Blend of History and Modern Luxuries, Meticulous Details, Pristine Grounds, and Exceptional Customer Service! I have looked at many barn venues, and I have not found a single one that compares to Inisfree Farm! "Barn-None" Inisfree Farm is definitely above and beyond any other venue that I have toured! I have had many questions and many requests, and I have always been treated with the utmost respect and in a very timely manner. As a matter of fact, I feel as if Miss Peggy and I have become great friends during our many conversations. She is a true Southern Lady with impeccable taste and attention to even the tiniest of details, well to EVERY detail, large or small!